Saddam sleeps for only four or five hours. Because when he sleeps, he shuts his eyes. And when he shuts his eyes, he has to trust those around him. And that is the one thing the Great Uncle cannot do. Men like Saddam’s youngest half-brother (La Haine ’s Said Taghmaoui), head of the notorious state-security system, feared for its use of torture and assassination. ‘Chemical Ali’ (The Kingdom ’s Uri Gavriel) was Saddam’s other half-brother, who slaughtered up to 200,000 Kurds using poisonous gas. Saddam’s nephew Hussein Kamel (Syriana ’s Amr Waked) married his favourite daughter and created the Great Uncle’s personal guard. For Saddam, weakness was something to be abhorred and violently amputated. Saddam’s palaces – and there were more than 20 of them – flowed with fountains, pools and in-door streams. In the desert country of Iraq, water is a symbol of power. 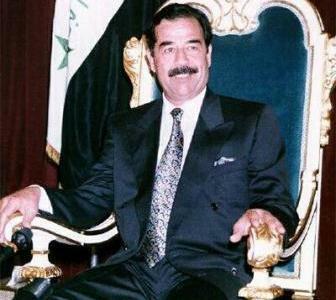 As Saddam’s daily paranoia grew, blood flowed just as freely. After suffering early losses in the war with Iran, Saddam asked his ministers for advice. Health Minister Riyadh Ibrahim suggested Saddam temporarily step down to encourage peace negotiations. Bits of Ibrahim’s dismembered body were delivered to his wife the next day. When one of his generals was overhead bad-mouthing the dictator, a simple execution was deemed too lenient. Before killing him, Saddam had his tongue be cut out, his son executed, his home bulldozed and his wife and other children left on the street. “Not only this, but Saddam prided himself on his ability to carry out the violence himself,” explains Holmes. “In some ways, this was the core of his success. He was a man willing to do what others flinched from.” When he seized power in 1979, Saddam forced top party members to help execute more than 20 of their ‘traitor’ colleagues. When it came to Adnan Hamdani, the official who had been his close friend for the last decade, Saddam pulled the trigger himself. Having done so, he then visited Hamdani’s family and paid his sincere condolences. Condolences, not apologies. The distinction was clear. Saddam had been married for three decades to his wife Sajida (played by House Of Sand And Fog ’s Shohreh Aghdashloo). Saddam gave her million-dollar shopping sprees and beautiful clothes. She remained loyal – despite her husband’s relationships with other women. As ever with Saddam, there are stories. Stories that he took virgins to his bed each night. That he even had one young woman killed after a decadent affair. Everyone knew about Samira (played by Casualty ’s Christine Stephen-Daly), his long-time mistress and future wife. Not least her husband. The Godfather trilogy is really the tragic story of Vito Corleone’s son, whose paranoid obsession with power destroys him as he murders his own brother and ends up isolated, trapped and alone. Impossible to know whether Saddam appreciated the irony, as lay back in alone bed, staring at the books about Joseph Stalin that lined the walls.